Saba and her twin live with their father and younger sister Emmi, in an incredibly desolate place. Things are tough. Everything changes for Saba when her brother is kidnapped and their father killed. She is determined to save her brother, no matter what. She leaves everything she knows behind and races across the harsh dustlands, fighting for her very survival, filled with a red hot rage that fills her up and spurs her on. She can’t trust anyone, not even the boy who saves her life, there is something about hime though that draws her. To fulfill her task and rescue her brother, Saba must learn to trust, lead and silence the stirring in her heart. A civilization destroyed, reduced to scavenging and violence. This is the world Saba draws us into. At first I have to say I found the language style (spelling as spoken) a little difficult to get through but at some point I realised the story had swept me up and sucked me in and I didn’t even notice the laguage anymore. Saba is an interesting, torn and stubborn character. She is tough, really tough and her journey is engaging. The characters around her are wonderful counterpoints to Saba, equally strong yet able to draw more out of her. 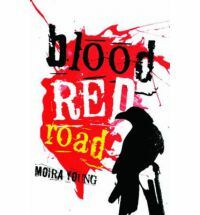 Young has painted a harsh, often cruel environment and planted in it tough and ruthless characters. Even their sense of humour is rough, though the playful moments are welcome, timed well in the text and help bring balance into the tense atmosphere. Young has done a great job weaving such characters into this world. Saba, her friends and the world are tougher, certainly rougher than some of the dystopian worlds that are making appearances in YA fiction and there is something very appealing in its rawness. For a reader willing to embrace it, this book will be a rewarding read. Gritty and enjoyable.